Tonight we are meeting with some people who may join us in ministry on our care team. A care team is a group of people who are "back home" and who assist with keeping us on the field. Care teams help with areas such as logistics, communication, prayer, re-entry, and other things. Please pray for this team, that God would bring them unity and joy working together. So...if you haven't heard yet, there has been a few adjustments made to our timeline. 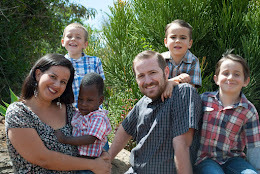 We have been asked by Paul and Marcia Cowley to come out to Nairobi one more time before making the big move, in order to get a chance to teach at DSM, and for our families to meet in person. Due to the fact that the Chesboros (who also work at DSM) will be on furlough from December through May, the earliest that we will be able to head out there is late May - early June. After this short trip, we will then finalize our plans for departing permanently to Nairobi. Please pray that God would direct our steps as we go through this time of change. Pray that He would give us patience.